Why do cell phones work? Q: Why does sticking out my tongue help me concentrate? A: Observe the fearsome tongue of the Gorgon, as seen in this 5th century BCE coin discovered in Mysia. 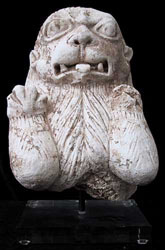 Similarly, stucco lions discovered in the Gandharan region of SW Asia (now modern day Afghanistan) have ptruding tongues and fearsome grimaces. In Celtic myth, Ogmios was a god whose cult was located in Gallia Narbonensis; Ogmios was the god of eloquent speech, and was often depicted with a thin gold chain running from his tongue to his ears (see the Celtic drawing of Ogmios from the Book of Kells). 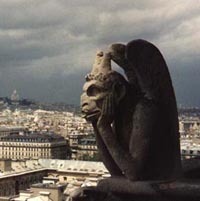 Medieval sculptures of gargoyles perched on the sides of churches often have protruding tongues (see example from the Cathedral of Notre Dame). In contemporary times, Einstein was photographed during a deep contemplation of the theory of relativity with his tongue out. Using Carl Jung’s theory of archetypes, in which repeated patterns of observable phenomena demonstrate more fundamental patterns or prototypes that result from the collective unconscious, it is clear that the protruding tongue is the key to concentration. But why? The answer lies in the Bible. If you examine many creation myths the world round, several key similarities emerge. First and foremost, the flood myths, which some Biblical scholars have used to determine that the Biblical flood of Noah’s time was actually real. From the Hopi tribe of North America to the ancient Aryan culture of India, nearly all cultures share the meme of a global flood wiping out the majority of human populations all over the earth. Other scientists have used these similarities to seek Mount Ararat and the remains of Noah’s Ark. To date, none have provided conclusive evidence that Noah’s flood actually existed. Much to their shame, they recently realized that the answer was right inside our mouth. In days of yore, there were all sorts of strange beasties crawling around the earth. Remember, this was before the whole “two-by-two onto the ark” thing, so there were manticores, unicorns, gryphons (Figure 1), etc. Among these creatures were the nephilim. The word “nephilim” comes from a Hebrew word meaning “those who have fallen,” and according to Genesis 6:4, “The Nephilim were on the earth in those days-and also afterward-when the sons of God went to the daughters of men and had children by them. They were the heroes of old, men of renown.” Nephilim were generally considered to have been the descendents of the angel Shemhazai and his sect of angels who lead a descent from heaven (as described in the Book of Enoch) to teach humankind the ways of God. They were, however, corrupted by the tribes in which they lived, and soon fell into lustful ways. The offspring of the angels and the men were the nephilim, a new race of men who were spiritually halfway between heaven and earth, and stronger than average mortals. Now one little known fact about angels is that the breadth and strength of their many wings creates the necessity for nearly hollow bones to achieve maximum lift in tricky places like the tops of arks. As a result, angels must be very careful when they take off and land, for they are particularly prone to strong gusts of wind, which can bash them into nearby trees or rocks. Young angels take many years of flight lessons before they’re able to take off without a hitch. Actually, one of the alternative reasons for the Eisenhower Interstate Highway System (in which one mile out of every five on Interstate highways must be straight, ostensibly to land an airplane during wartime) is because young angels on their earliest do-good missions on Earth sometimes get stuck without safe places to take off and land. It’s considered a point of good humor that most young angels at some point had to tromp at least five or six miles in ridiculously flouncy shoes to the nearest take off strip to be able to get back to Heaven. At any rate, because of these tricky physiological circumstances of having a human body and some gi-normous wings, angels utilize their tongues to test the prevailing wind conditions. Sticking their tongues out allows them to quickly predict if weather will allow them to leave their current environs. The nephilim, as immediate descendents of the angels, possessed a similar fragile bone structure, and despite a lack of wings, they still continued the trait of concentrating on their motor skills by sticking their tongues out. As the nephilim continued to interbreed with the tribes of men, this became a residual trait of human biology, much like the appendix. Now, many thousands of years after the Flood of Noah, we humans still stick out our tongues as a result of our ancient heritage with the nephilim. So next time you’re concentrating, remember that you could have it much worse - you could be trying to take off with a 15 foot wingspan in a small enclosed space.